Now that’s a good question, innit? Is it possible to designate, rank and classify music objectively? Traditional ones? Can they be applied to artists and their emissions through time? Does it apply to Beethoven in the same manner as to Drake and Black Sabbath? John Sheinbaum starts off by elaborating on how music has been traditionally classified as good or bad before he ventures out to outline his own idiosyncratic framework for assessing music – one that does not subject itself to the dictatorship of categorization and one that deliberately transcends Schubladendenken, styles, moods or genre specific confines. As the centre of Sheinbaum’s value system is simply the joy both of making music as well as the result on the recipient’s end – the ultimate common denominator. 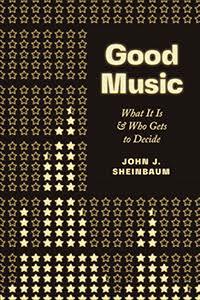 Sheinbaum masterfully questions values, definitions and perceptions and lets the reader come to his / her own conclusions as he meanders his theories revolving around musical themes like deepness, unification, authenticity, originality, heroicness, connectivity and seriousness. The merit of Sheinbaum’s emissions and what makes the book a never not enjoyable read lies in his compassionate and humane approach that is not only enthusiastic and optimistic in nature but challenges mainstream conceptions and the way we blindly follow along outworn traditions. A recommendation for any music enthusiast and anyone who falls prey to the notion that one composer or musical style is superior to others.